Udemy, founded in 2010, is a fast growing online training marketplace that allows experts of any kind to upload course material for free or charge. Udemy separates itself from other classic learn to code platforms by providing tools for experts to use for creating class materials that facilitates the growth of their massive course database. Udemy offers training and education for a wide variety of subjects, but for the purposes of our audience, we’ll cover Udemy’s web development, web design, and app development topics. Udemy has a library filled with more than 25,000 courses, and currently there are well over 6 million students enrolled. Since Udemy courses can be produced by anyone who fancies themselves an expert, the style, affordability and usefulness of courses can vary widely. Just as you see in a traditional school, professors often adopt their own teaching style. That means each course is different from the last — especially when a number of professors are involved. In addition, when you search for courses on a particular topic you are given multiple options, with many different teachers. For each course, your progression is tracked and you can take notes at any time. You can also leave questions for the teacher, who all seem to be responsive and helpful. Teachers have the option to upload videos, streaming videos (live), Powerpoint presentations, PDFs, audio, and compressed zip packages (practice files and such). What’s actually accessible depends on the course and the teacher’s style. A lot of times, you’ll simply find videos with teachers talking over code via screencaps, screen shares or whiteboards. Other times, you’ll find courses that consist entirely of Powerpoint presentations. This isn’t necessarily bad, but your own learning style will determine how useful these courses are. For instance, some people may not find the videos where the instructor talks over code helpful while others may prefer this teaching style. There are more than 25,000 courses available so there’s plenty of content — there’s no question about that. As far as the longevity of the courses offered it varies greatly and depends on the course instructor. Because this is a marketplace of sorts, you will find lengthy courses that cover every area of a topic in great detail, and then you will also find courses that cover only the basics. The good news is that if you find a course you don’t think covers enough of a topic, you can just return to the marketplace and search for another. In addition, each listing has a 5 star rating, hours of video and recommended knowledge level. With these features, finding the course you need is simple. 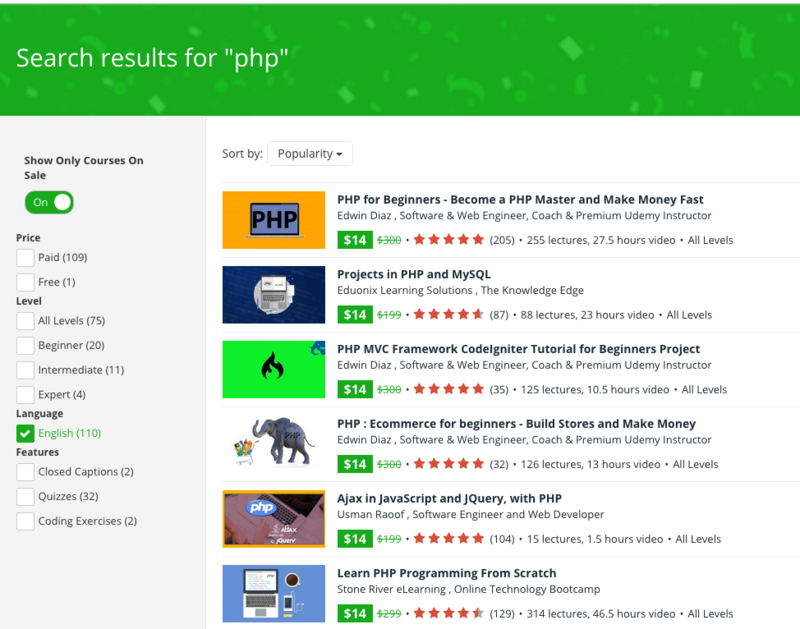 Udemy lists out the top courses when selecting a topic. To make it easier for you to browse, we’ve curated a few that we know would interest our readers. For a few specific courses, here are some examples of Udemy’s best. Since there are so many different formats and courses offered it’s difficult to judge platform accessibility in its entirety. That said, most courses do not offer downloadable transcripts or closed captions support. In our example search above for PHP, there were only 2 results out of 110 that offer Closed Caption. If accessibility options are necessary for you, look to one of the other online code schools such as Tree House. For the sake of the review we’re going to repeat ourselves here, support varies widely across the platform. For the most part, teachers are quick to respond when you have issues and they are remarkably helpful when completing exercises and reviewing courses. However, that also depends on the instructor. You may find a course or two where the instructor takes longer than usual to get back to you — similar to what happens in a University setting. However, that also depends on the instructor. You may find a course or two where the instructor takes longer than usual to get back to you — similar to what happens in a University setting. This is not necessarily a huge issue, but it is something you need to be aware of. As with many of the other aspects discussed in our review, the lesson quality varies greatly with Udemy. In fact, that is one of the biggest cons of the platform. The production quality and structure of courses is terribly inconsistent. It depends on the instructor and how they have decided to present a lesson. In addition, this leaves a lot of room for error when it comes to editorial oversight. You’ll encounter many lessons with spelling and grammar errors, inconsistent writing and even varying lesson styles. There’s plenty of high-quality content on offer, but you will need to sort through an ever expanding marketplace to find it. Luckily, the user based rating system help bring the cream to the top. Udemy subscription plans vary depending on the course and instructor. Instructors choose the price for a course, and so they can range anywhere from free to hundreds of dollars a piece. Don’t let that scare you away. There are plenty of affordable courses on the platform, and there are plenty of free ones too. Just know that some of the courses are expensive. Keep in mind, you don’t need to purchase anything to browse the marketplace or use the platform. Udemy doesn’t have a true rival because of how different it is. The closest platform in terms of mechanics would have to be Udacity because it also relies on courses that are created by the outside teachers. Udacity focuses more on university level course material and nanodegrees, where Udemy is focused on helping you learn vs becoming certified. You can find a lot of great content, lessons and professors via Udemy’s marketplace. When you find the right course, they’re often reliable, informative and easy to follow. However, it may take a while to find exactly what you’re looking for — that is if you know what you’re looking for. Therein lies the biggest issue with Udemy. If you’re new to coding and web design then you probably don’t know where to start. That’s where platforms like Treehouse and Lynda come in handy, they walk you through everything. Comparatively, Udemy does offer a much larger library than most and the variety of topics are insane. You can find a lesson on just about anything through Udemy’s marketplace. Overall, we recommend Udemy as a solid option to learn coding concepts with the caveat that your mileage may vary greatly based on the course selected. Udemy’s recent popularity has allowed the best courses to become more evident as more students provide feedback. This limits your chance to enroll in a “dud”, therefore, making the platform a reliable source of online education.